The final Sunday of partypokers massive POWERFEST series saw several huge paydays, with Finnish online poker legend Sami LarsLuzak Kelopuro grabbing his share of the High Roller titles on offer. Starting with Kelopuro’s win, he was among 594 entries to POWERFEST Event 68, a busy $1050 buy-in High Roller that had close to $100k extra in the prizepool. The Finnish pro wasn’t the only big name in the frame as they closed in on the serious money, Canada’s Chance ChanceSeeYou Kornuth running deep, as was another Finn, tikidiii16, who was looking to what had been a fairly miserable POWERFEST for him so far. Kornuth had to settle for 4th spot and just over $36k and the title eventually came down to a Finnish heads-up duel, Kelopuro eventually scooping the $109,414.80 that went with the title. 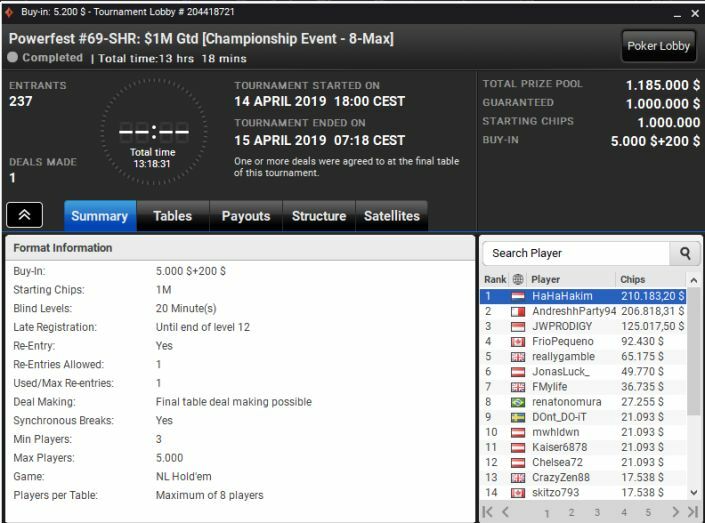 The biggest win of the day came, unsurprisingly, in the $5200 buy-in 8-max Championship event, with 237 runners chasing almost $1.2million – and over $200k up top. partypoker’s team pros made a decent run at the title, Isaac Ike_Haxton Haxton, Jason Jason_Koon Koon, and Nikita fish2013 Badyakovskiy all in the money, but only Renato renatonomura Nomura would reach the final table. Nomura busting in 8th spot left the way open for the likes of Jordan JWPRODIGY Westmorland to take a tilt at the day’s biggest title, but when he fell in 3rd it was deal time. 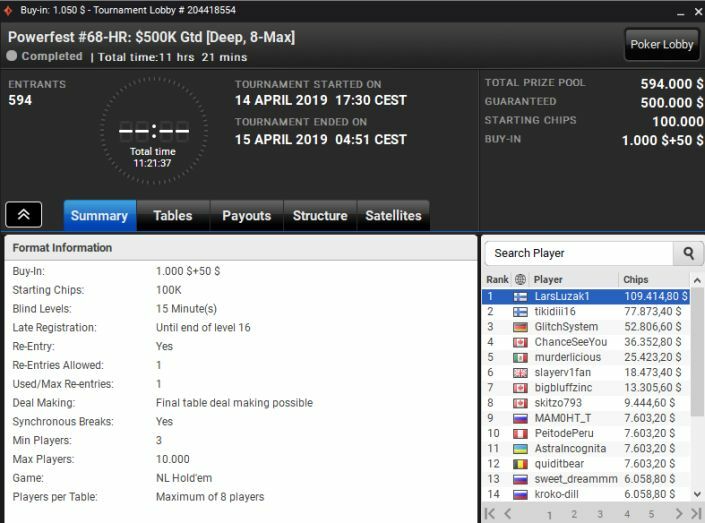 Maltese-based AndreshhParty94 and HaHaHakim split the prizemoney almost equally – just over $200k apiece - with Hakim taking the title. There was another massive payday – several in fact – when the $1million GTD POWERFEST Phased final attracted 1063 entries, with 3 players making a deal that saw 6-figure payouts for the trio. With the tournament well into its 12th hour, daskalos20, pepebilu and mexicanos22 had seen off the rest of the field and decided it was time to cash in, mexicanos22 taking the victory and an extra $25k. The final day’s play in the POWERFEST series had brought out the numbers, the $530 buy-in High Roller seeing 640 players chasing $320,000, the sow 8-max event featuring some well-known online poker names. Sweden’s haddoken is an ever-present at the sharp end of tournaments, as is Russia’s ilushan, but 10th and 4th respectively was the best they could muster. In the end it was SNGoenka who scooped the title and $58,944 edging out GuyFromTiltBook who nevertheless ended POWERFEST on a high with a $42k payday. 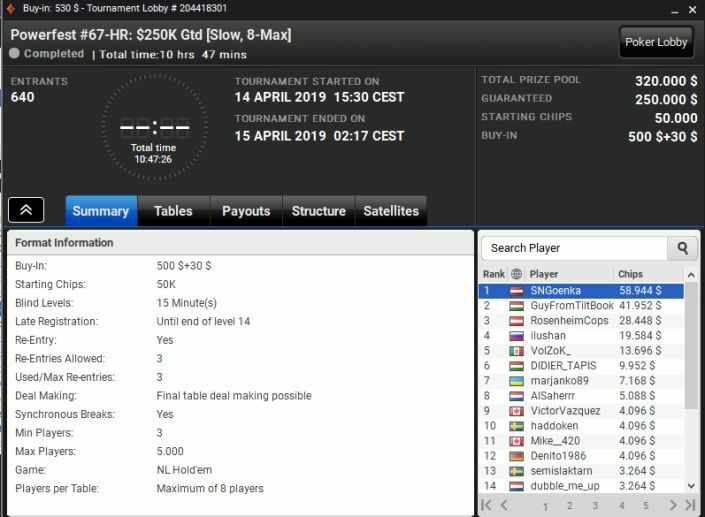 That still left the no-small matter of the $215 buy-in, $250k GTD event 68-H, an absolute beast of a tournament that saw 1609 entries and over 14 hours of play. Canadian players were still looking for their first big win of the day, and vukson came very close, outlasting compatriot WWWpartyCOM who took 5th spot, but falling at the final hurdle himself. GGuantanam3ra closed out the victory and walked off with $54,287, vukson having to settle for the runner-up prize worth $38,500. And that’s that for another epic partypoker POWERFEST, but we’’ll be back next Monday with results from the regular Sunday grind on partypoker – watch this space.